With the anniversary of the Discovery of Meridell approaching quickly – the 30th day in the month of Swimming... mark your calendars! – many of us Neopians are planning on taking our pets to the grand medieval land in honor of this festive and joyous occasion. However, not many Neopians frequent the old land these days... unless we're making the trek to Illusen's Glade in the hopes that this exquisite earth faerie will grant us one of her incredible potions or keepsakes. So today, I will be your tour guide to the great Meridell. Let me show you around and tell you about the best spots this little town has to offer – and the worst! I recommend you start out your day by playing a quick game of Cheeseroller... you're bound to get a bit messy, but this is one of the oldest traditions in Neopia! It's a great way to begin to explore the land of Meridell, and if you win, you get to keep your cheese as a souvenir! What's not to love about this classic game? Although, I'd warn against the Brain Cheese! Fragrant Ummagcheese is delicious, but expensive; if you're looking for a cheap but satisfying option, choose the Honey Cheese. It may sound strange, but my neopets and I love it, and have to go back for seconds. After you finish your game of Cheeseroller, I'd suggest avoiding the Turmaculus (he's been known to eat the petpets of neopets who get too close to him! ), and heading on over to Illusen's Glade. If you've been here before, there's no need to go again... it can get rather hectic with all of the Neopians running around trying to fetch her items! However, it is a beautiful wonder of Neopia, and the faerie – if you can reach her – is extremely kind. The next place I suggest is Merifoods! This is a hidden gem within the hills of Meridell. 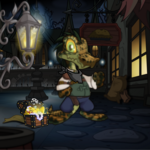 Many Neopians are unaware that you can catch a rare Draik Egg here! You can use this to create a new friend or sell it to the highest bidder to make a nice profit! Even if you don't catch one (they *are* very rare), pick up a few of Meridell's delicacies while you're here: Hot Crossed Buns and Bullseye Pie are two of my favorite treats, and if you're brave, let me know how the Chunky Meaty Stew or Stone Soup taste! Take your food to go and enjoy it on one of Meri Acres Farm's beautiful fields. Once you finish scarfing down your meal (and I guarantee you will! ), take an hour or two to explore each of Meri Acres's unique treasures... I swear, the little farm alone has more to offer than all of Kreludor! I advise you to play a couple games of Potato Counter (or the extreme version if you're feeling adventurous) and win some extra cash. Pick Your Own is always exciting – will you win delicious and exotic Meridellian berries or just a few piles of dung? You can try to Guess the Weight of the marrow – although some say winning the lottery is easier than this! However, while you are journeying through Meri Acres, make sure to AVOID THE RUBBISH DUMP AT ALL COSTS! It stinks, and many Neopians think they will be lucky enough to pick up some treasure here, but all you will find is garbage! Next stop: Ultimate Bullseye (skip over Turdle Racing – the Poogle races in Faerieland are much more exciting to watch). This game has always provided difficulties for Neopians, but I recommend you check out a guide before you go, and perhaps you will win yourself an avatar! This game is a Meridell must-see, and a very old tradition that will bring you back to the medieval times. Now, a lot of tourists go to Meridell just to see the castle. In my opinion, it is not what it used to be. I really think you can skip the castle, though Kayla's Potion Shop has some nice little brews. Now that Invasion of Meridell is gone, and the old king is constantly whining and scoffing at the jokes he once loved, there isn't much to see in the castle anymore. Instead, I suggest catching a game of Round Table Poker; warning: this game is addictive and could lead to gambling problems! Just play a round or two – perhaps you'll make some neopoints, and the other players are quite the characters. If your neopet is in need of a new little friend, stop over at Ye Olde Petpets. They have some popular little guys: the mortog, cyodrake, turmac, gallion, and ukali. These are some of the most popular Neopian petpets, and they will match with any kind of pets! This little shop is truly one of the greatest Meridell has to offer. Another spot I would make sure to avoid is Kiss the Mortog. Many Neopians play this for an avatar, but what they are unaware of is that these mortogs are riddled with disease! Sure, it may be a fun game, but recent reports at the Hospital have been claiming that many cases of NeoWarts and Itchy Scratchies have been attributed to the mortogs from this game. If you do get sucked into playing, please bring some soap to wash your hands afterward, or you just might have to make an unwanted trip over to the Neopian Pharmacy! Lastly, one of my favorite Meridell spots – to test my wit or just chat with a wise Ixi – is Shapeshifter! This game *never* gets old. It is extremely difficult, that is true, but it really takes a lot of skill and thought just for a puzzle game. Sinsi can get a bit judgmental if you seem to be guessing randomly, so I really do advise that you try your best. As they say, "The aim of the game is to get all the symbols to be the same." I wish you luck with this one because it really will test you. To all, I hope from the bottom of my heart that you enjoy yourselves in Meridell! Have a wonderful day, and please try to take in the wonderful culture, no matter what you end up doing in this lovely medieval land!